While the Pope's spending this afternoon in St Peter's presiding at his second episcopal ordination of the month – this time of the new "vice-mayor" of Vatican City, now Bishop Fernando Vérgez – the more significant elevation for Curiaworld took place last weekend, in perhaps the furthest setting possible from the splendors of Rome. 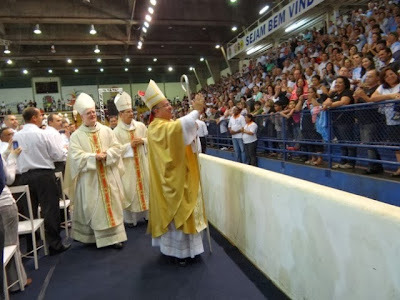 Staying true to his roots amid a "Cinderella"-esque ascent to one of the Holy See's most influential desks, Msgr Ilson Montanari became an archbishop in a gym (photos) in his home diocese of Riberão Preto in Brazil, in rites led by his own ordinary. A pastor and local dean until being sent to the Congregation for Bishops in 2008, the 54 year-old's launching from 2nd class minutante (junior desk-clerk) to second-in-command of the all-powerful Hat Shop – a post traditionally reserved for the Vatican's most-decorated diplomats – has continued to arouse slack-jawed reactions since its announcement last month; over the week just past in Baltimore, one Rome vet termed the move nothing less than "unconscionable." 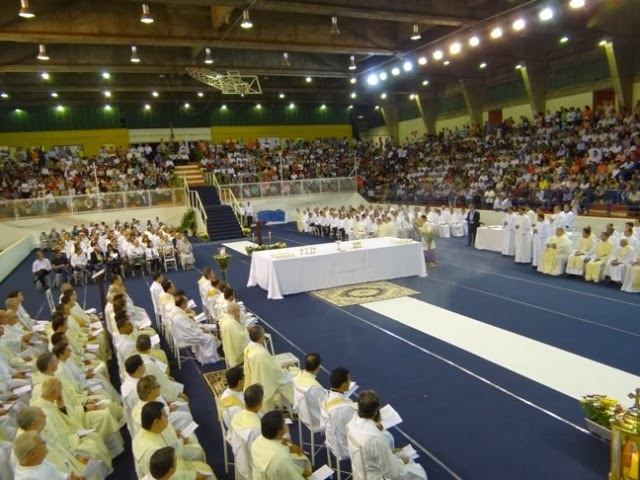 Speaking of American bishops, this weekend brings a significant gathering of the episcopates of North and South in Mexico City convened by the Holy See, focusing on the figure of Our Lady of Guadalupe in the contexts of both the New Evangelization and the Continental Mission sketched out by the now-Pope in the 2007 Aparecida Charter of the Latin American bishops. With Francis slated to deliver a video message to the gathering tomorrow, among other A-list prelates on-hand will be Cardinals Oscar Rodríguez, Seán O'Malley, Marc Ouellet, Juan Luís Cipriani and Timothy Dolan, as well as Archbishops José Gomez of Los Angeles, Orani Tempesta of Rio, Charles Chaput of Philadelphia, Thomas Wenski of Miami, Allen Vigneron of Detroit, the new Canadian bench-chief Paul-Andre Durocher, and, in his first turn as USCCB President, Archbishop Joseph Kurtz. Then again, such are the days that the key player at the conference might just be a layman. Named #2 of the Pontifical Commission for Latin America – a post previously held by successive archbishops – by Benedict XVI in 2011, the facilitator of the weekend will be the Uruguayan Guzmán Carriquiry, one of Cardinal Bergoglio's few friends in the Curia before his election, now said to be an influential broker and sounding-board for Francis.